Chausson Titanium- Coming this Saturday! 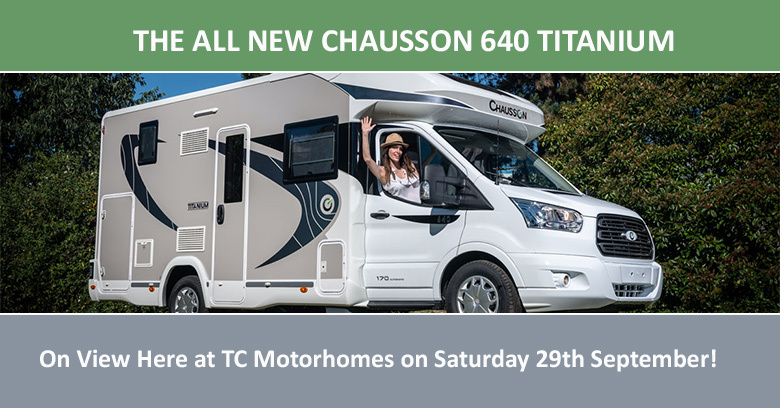 Our first Chausson 640 TITANIUM will be on display here at T C Motorhomes for the first time on Saturday 29th September, between 8 am and 3 pm. Come along and take a look inside. To speak to somebody here at TC Motorhomes to find out more information then please call: 01227 289111. We have also set up an event on our Facebook Page where you can register interest. Terry & Jane are oh so excited to be collecting their New Chausson 640 Welcome Motorhome, from Shane Catterick at TC Motorhomes in Herne Bay Kent, on the New Registration Day !! So today for the first time we see 68 plates being driven around legally on our roads. So, It`s their first motorhome, and the excitement is tempered with a little anxiety, not unusual in such circumstances ..
David Sharpe, (Engineer at T C `s) was available to go through and explain the workings of the Chausson to Terry & Jane, which made an enormous difference and gave them both a huge confidence boost. Grateful thanks to you both, Jane & Terry, for your valued order and support. Use your New Chausson Motorhome as often as possible and have tremendous fun with it!